On another day, reread the story and review the chart. Use this poetry frame to encourage your students to think about their own feelings. Yesterday I had the _________________. Today I got the ___________________. Tomorrow I hope I have the _____________. This poetry by my second graders gives me the pinks...the oh-so-happy, lips smilin’, tickled-pink pinks! 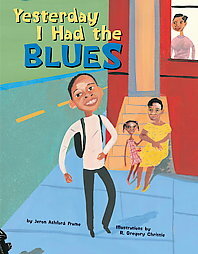 Do your kids have the blues? Let them watch this animated clip of the story. They’re sure to want to read along, and before you know it they’ll feel golden!